​ Morson held a roundtable debate with HS2 and key representatives from the supply chain to discuss how we futureproof the rail industry in line with HS2’s skills, employment and education targets. Get your copy of the HS2 whitepaper to discover our findings and key opinions. As Europe’s biggest infrastructure project, HS2 is the most exciting major rail scheme in a generation. But the Government’s £55.7billion investment isn’t just a project to improve rail links between the North and South of England, it also provides the perfect platform to develop a talented, highly skilled workforce and create new, rewarding careers for tens of thousands of people. To ensure HS2 changes the face of Britain’s workforce by encouraging a diverse, inclusive and talented pool of individuals, one of its five sustainability themes is ‘Opportunities for all: skills, employment and education (SEE)’. To deliver on a promise of producing a lasting legacy of highly skilled, experienced and motivated people, HS2 Ltd has set a number of SEE outputs for the project’s supply chain, which are being monitored throughout the lifecycle of the programme on each company’s ability to deliver against set targets. There is ongoing discussion in the industry relating to the skills gap and how we need to strengthen our UK skills base through apprentices, diversity and social engagement. 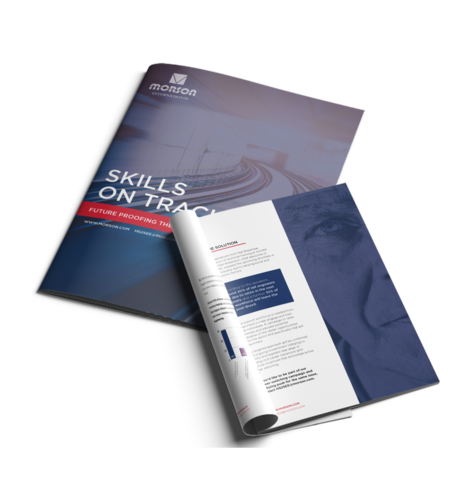 HS2 Ltd’s strategic objectives in relation to skills provide a structure to mitigating this gap, however there are still challenges associated with achieving all of the targets set. To understand these challenges, we hosted a roundtable event held at the National College High Speed Rail (NCHSR’s) Birmingham Campus, which brought together representatives from the Morson Group, HS2 Ltd and the supply chain to discuss the issues and opportunities around training, apprenticeships, collaboration, Government policy and more. The debate was attended by representatives from BBV, Bechtel, CEK, Mott MacDonald and WSP, as well as local organisations including the NCHSR and Birmingham Chamber of Commerce, and specifically focussed on the SEE targets set by HS2 Ltd. The whitepaper details our findings, including key opinions from those who attended the roundtable, results from an audience survey and the solutions that are needed if we are to achieve HS2’s vision of being a catalyst for growth across Britain. As the UK’s number one technical recruiter, Morson International plays a leading role in sourcing the skills required by infrastructure employers. Working in unison with sister companies Morson Vital Training and Vital Human Resources, the Morson Group has a long history of successfully delivering white and blue-collar talent with the right capabilities and skillsets, and upskilling the next generation of technical professionals.